Adam Gilchrist might have called Sachin Tendulkar a "bad sport" but for former Sri Lanka captain Arjuna Ranatunga the Indian batting maestro is one of the best well behaved cricketers he had played with. Tendulkar was one of the nicest guys I played cricket with. The thing I admired of him was the commitment for the game.I have not seen anyone who is so committed to cricket. Actually I learnt a lot from him. I was not committed enough for my batting. The result shows. I think he is a role model for any young cricketer, Ranatunga said. 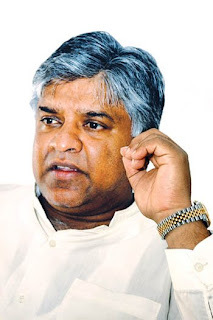 Ranatunga - Chairman of Sri Lanka Cricket,said Tendulkar deserved to become Test cricket's highest run-getter surpassing West Indian great Brian Lara. I think Tendulkar deserves to do that because of the commitment. He is one of the greatest cricketers I have played cricket with." Ranatunga feels that Tendulkar can easily play a couple of years of cricket and he should be given the luxury to decide when to hang his boots.But he is still fit enough to play cricket. Even Sourav Ganguly, he is still getting runs. I think there will be a big vacuum when the 'fab four' goes.